Napoli have managed well in the Europa League, having qualified for the quarter-finals where a difficult test against Arsenal awaits. 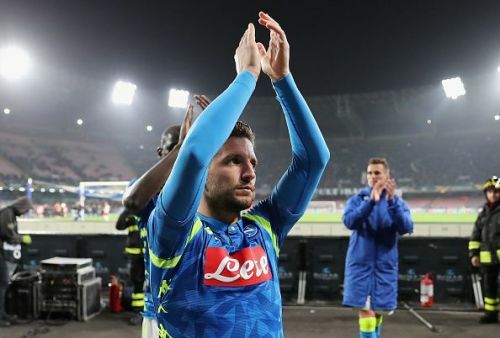 While Napoli have struggled to keep up with Juventus at the top of the Serie A table, they have impressed throughout their European campaign this season. They were ultimately eliminated in the UEFA Champions League group stage, but had defeated Liverpool at the San Paolo and were kicked out of the competition because Liverpool had more goals for. Napoli striker Dries Mertens assured fans that the Partenopei will not be intimidated by their English opponents. “We faced Arsenal when Rafa Benitez was the Coach, but the team has grown so much since then. We lost some players, but brought in others, while gaining experience. We’re stronger now. The first leg of the much-anticipated tie takes place at the Emirates on April 11th with the return leg at the San Paolo on April 18th. The winner will take on either Villareal or Valencia in the semi-final. The Italians may be forced to take on Arsenal without captain Lorenzo Insigne though, as it was announced earlier this week that he had picked up a thigh injury and will miss up to three weeks of action. Unlike Napoli though, Arsenal still have quite the fight on their hands to finish in the top four in the Premier League and it remains to be seen whether they will prioritize one competition over the other. Head coach Unai Emery had won the tournament for three consecutive seasons - 2013/14, 2014/15, 2015/16 - with Sevilla though and will surely be adamant to bring European silverware to London as well.